Having naturally curly hair, I’m aware of its ups and downs. One of the biggest negatives of a head full of curls? Frizz. To diminish frizz once and for all, I looked to Japanese hair straightening – a chemical relaxer that straightens and de-frizzes your hair. It truly works, and for the past eight years, I’ve annually been getting the treatment done. This year, however, is different. I’m letting my curls grow out, which means I’m saying hello to frizz and fly-aways, and spending all of my free time researching the best products to get my locks under control so I can learn how to tame frizzy hair for good! When it comes to frizz, it’s important to use products formulated with ingredients that will lock in moisture and protect your hair from humidity. Ingredients like argan and bamboo oil are natural frizz-fighters, while vitamins and nutrients work to soften your hair so it’s smooth as can be. Look for products formulated with ultra-moisturizing ingredients such as cocoa and shea butter, and naturally derived extracts that work to soften dry hair. Sweet almond and meadowfoam seed work together beautifully, as proved by Neutrogena’s leave-in cream. And keratin proteins mixed with coconut and avocado oils in OGX’s conditioner are a match made in frizz-free heaven. As we head into the hot and humid months, frizz becomes even more of a problem for most people, so it’s important to use a handful of products in tandem to get the best results. Using a frizz-fighting shampoo is great, but using a frizz-fighting styling cream after a frizz-busting shampoo and conditioner will work even better. From Living Proof’s No Frizz Shampoo and Neutrogena’s Triple Moisture Silk Touch Leave-In Cream, to Moroccanoil’s Frizz Control and John Frieda’s Full Repair Touch Up Flyaway Tamer, these hair products will lock in moisture and protect your hair from humidity, and at less than $40 each, they will teach you how to tame frizzy hair without spending a fortune at the salon! Shampoo is the first step in any frizz-free journey. Living Proof’s shampoo is formulated with the first new antifrizz technology in over 30 years, made with PolyfluoroEster to lock in moisture and repel dirt and oil. It blocks humidity, while cleaning and hydrating the hair for your smoothest, sleekest locks. If you haven’t worked hair oil into your beauty regime, you should! And if frizz is your problem, this hair oil is just what you need. Use it on damp hair before you style, or dry hair to add a touch of shine. It strengthens and softens strands, and reduces frizz and flyaways. This frizz-fighting cream is a steal! It absorbs instantly and conditions the hair so it’s smooth and completely manageable. Three naturally derived extracts work together to beat dryness – olive, meadowfoam seed and sweet almond. And as an added bonus it contains UV filters! This Moroccanoil spray will have your frizzy hair under control in no time. It’s weather resistant, so it’s manageable in both damp and dry environments and it was formulated with all frizz-prone hair types in mind. Infused with argan oil and vitamin E, it will have your hair smooth and nourished. A defrizzing serum made with Inca Inchi oil to moisturize your hair, John Frieda’s flyaway tamer does just that. It sooths broken hairs and flyaways with a spoolie brush so you can do touch-ups on the go. This leave-in cream not only provides smoothness to your strands, but will also protect your locks from humidity as it’s infused with Aquatorial. It also protects from heat styling up to 446 degrees and the Frizz Protection Factor allows you to choose the level of protection you need according to your hair type and humidity. Ouidad’s gel will fight the toughest frizz, leaving your strands soft and supple. Made with amino acids and vitamin A to hydrate the hair, and heat-activated wheat protein to prevent hair from expanding, this frizz-fighting formula was one made with frizz at the top of mind. Did you know bamboo oil is a killer frizz fighter? Formulated alongside kendi oil and other nutrients, this oil mist enhances hair health and banishes pesky frizz. Spray through your damp hair to style sans frizz, or spritz some on your dry hair for extra sheen. Eliminate frizz and hydrate your hair from root to tip with this smoothing cream. All it takes is a dime-sized drop worked through towel-dried hair to detangle and get your frizz under control. It also creates a protective barrier to shield pollutants and humidity. Packed with ingredients to soothe the hair, this keratin therapy conditioner is sulfate-free and will leave your hair glowing. The hydrolyzed keratin protein sooths your strands and along with coconut and avocado oils, and cocoa butter, the cuticles are straightened out for a frizz-free look. A greaseless and humidity-resistant formula, your hair will be looking glossy and frizz-free with this serum. Style by working the product through wet or dry hair, and you’ll be beating the heat and humidity all summer long. Have a head full of curls? This volumizing foam works against humidity to tame frizz and enhance soft curls. The formula is alcohol free and the foam is extra conditioning to provide volume and shine. Frizzy hair doesn’t have to be inevitable when the humidity hits. Use these products to tame and combat frizz for smooth hair that will take you effortlessly through the hot and humid days. 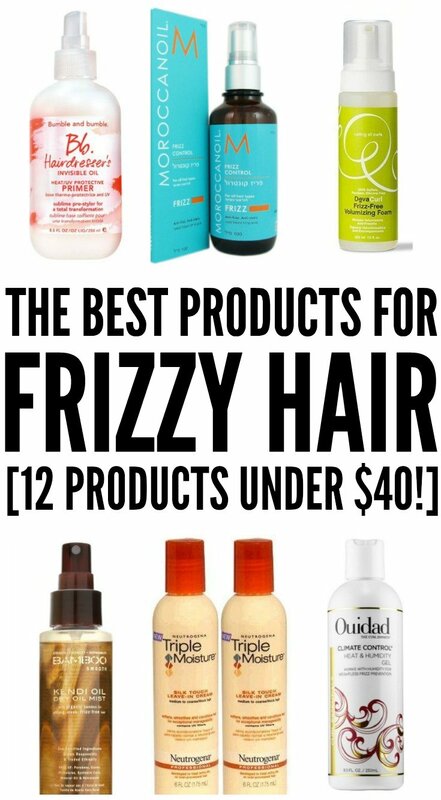 If you liked the products we recommended in this post, and learned a thing or 2 about how to tame frizzy hair, please share the love on Pinterest! And if you’re looking for more tips and tricks to keep your locks looking gorgeous, please follow our Hair board where we share all kinds of fabulous ideas!